Did you see my post 5 Places Online To Sell Your Clutter and Earn Cash? 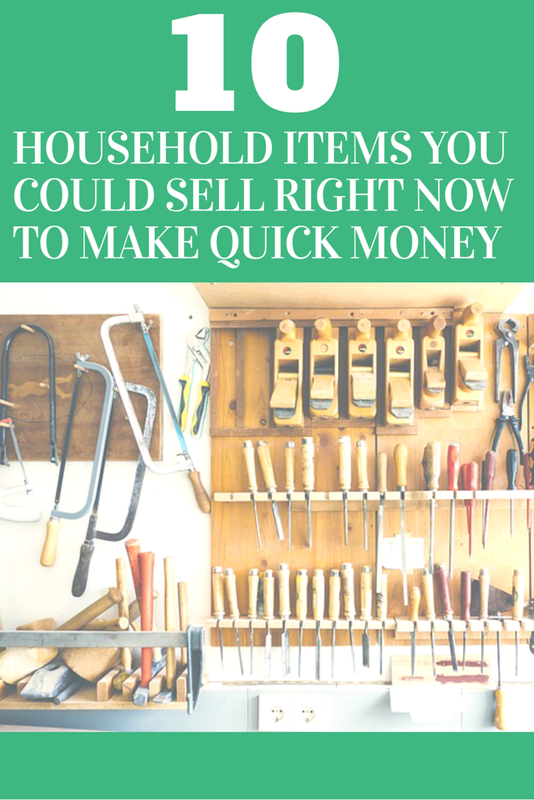 I am a HUGE fan of selling ALLLL of my house hold clutter (because let’s be honest, there’s a lot of clutter) and making some quick and easy money. I make the goal to sell a few items every month. It’s not a huge money maker for me, but it gives me a little extra spending money! I’ve had a few people comment to me that they just have “nothing to sell.” I truly believe EVERYONE can find SOMETHING (probably even a few things) to sell. The more desperate you are to earn some money the more likely you’ll find something. Today I am sharing a few household items that will usually sell quickly. I am hoping these ideas will inspire a few people and help you brainstorm what YOU have in YOUR house to sell. Children’s clothes are ALWAYS a hot item to sell online. Clothes will need to be in good condition (no stains or rips) in order to have a good chance of selling. Brand names (think Gymboree, Gap, etc.) will sell best. Used furniture is a GREAT sell. There is always someone wanting to buy. The great thing about selling furniture is that it doesn’t matter if the furniture is older or newer, you will most likely be able to sell it. There is a different market for all types of furniture. The older items will usually be bought by someone looking for a DIY project and the newer by someone looking for a good deal. Do you have an old phone or ipad laying around? Or maybe a computer that doesn’t work anymore? Electronics is a popular item to buy/sell used. Phones are so expensive to buy new which makes for a lot of people jumping on the opportunity to buy a cheaper used phone. Try selling your non working electronics as well! There are a lot of people out there who will buy something that doesn’t work so they can use the parts out of it. Baby items are some of my FAVORITE things to sell. High chairs, strollers, bumbo seats, cribs, bouncers, etc. These are all hot items to buy used. Use a magic eraser and washcloth to clean them up for an easier sell. If your kids are anything like mine, you probably have toys laying around that never get used. Clean those toys up and sell them! Popular items include plastic play toys (such as play kitchens and slides), barbies, hot wheels tracks, etc. Do you have a garage full of tools like I do? Look through all those tools (or ask your husband to do this) and find a few that haven’t been used in months (or maybe years???). We have been able to sell MOST of the tools we have tried, but not all. Search your house and try to find a few household decorations you could part with. Maybe your style has changed or you just want to scale back a little bit on the decor. Either way, there is always someone looking to update their home and will love getting a good deal on used decor! Look through your closet (or your husbands closet) and find a few items that haven’t been worn for weeks. Sell them! If you’re not wearing something regularly, there’s no reason to save it in your closet. I’ve sold shirts, pants, shoes, etc. If the price is right, it will most likely sell. Be sure to get out all stains before trying to sell any clothing. I have WAY to many boxes of holiday decorations. I have found that all I really need are a few favorite pieces and the rest of the holiday decorations are just not necessary. List these items for sale about 3-5 weeks before the actual holiday. This will increase your chances of being able to make a sale. Do you have a swing set that rarely gets used? Maybe a hose that just seems to sit around. I have always been successful in selling outdoor items. Things like bikes, slides, lawn mowers, sports equipment, etc. all sell really well. Look through all of your yard/outdoor items and if you find anything that seems to take up more space than necessary, sell it! Try doing this during the late spring months when everyone is anxious to get outside. What did I miss? What are some of the items you sell that are always bought quickly? Share below in the comments so we have even more ideas!